The town of Cannon Beach is along the Oregon shore, an hour and a half north-west of Portland, and is a great place to spend the day. It’s a quaint little town, with only about 1,690 people (2010 census), but it’s all the more a treasure. 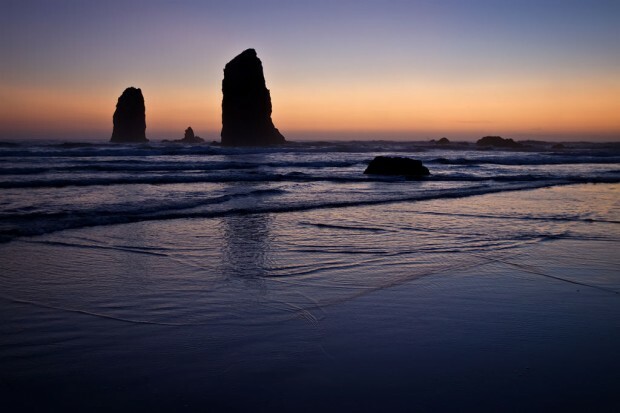 In fact, in the June 2013 issue of National Geographic, Cannon Beach was listed as “one of the world’s 100 most beautiful places.” Perfect sandy beaches stretch for miles, turns and puffins can be seen around Haystack Rock, and the Tillamook Rock Lighthouse can be seen far off in the distance. The Cannon Beach coastline is a great place to go swimming, fly kites with the kids, or just get a nice tan. If you’re in the mood for hiking, visit one of the four parks within the city limits: Haystack Hill State Park, Les Shirley Park, John Yeon State Park, or Tolovana Beach State Park. The town has an annual arts festival the first Sunday in May, a Sand Castle Building Contest each June, and a great 4th of July Parade. The town has all sorts of great activities and events throughout the year, which you can check out on the town’s calendar. Enjoy a show at the Coaster Theatre, and learn more about the time at the History Center and Museum. Cannon Beach has a bunch of great restaurants and cafés, like the Stephanie In Dining Room, or the Cannon Beach Café. And if you plan to spend a couple of days in town, you have dozens of choices for lodging.